Annie’s Bunny Grahams – Honey Flavor: So these little bunnies are amazing. When I want something sweet I grab a handful of these and it definitely curbs the craving. And the top of the box says to gently tug the ears to open – is that cute or what??? But onto the good stuff – these come in four flavors, they are trans and saturated fat-free, made with organic wheat flour and organic evaporated cane sugar, and are also a good source of calcium. Yummy bunnies! 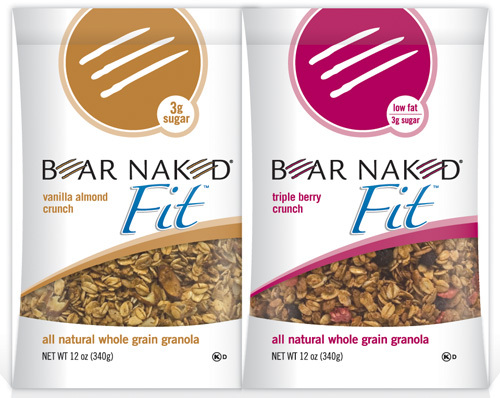 Bear Naked Fit Granola: I have had an obsession with Bear Naked Fit granolal for quite some time now. Some people need their coffee in the mornings – I need this. Bear Naked makes several great granola flavors but these are my two favorites. I mix it every morning with Kashi H2H cereal for a yummy filling breakfast with my banana. Onto the good stuff – made with real whole grains, low sugar and good source of fiber, low glycemic index, all natural – no artificial flavors, no cholesterol, no hydrogenated oils, no high fructose corn syrup, no preservatives and 0 grams trans fat. Also vegan and vegetarian friendly if that is your lifestyle. Go buy this – NOW! 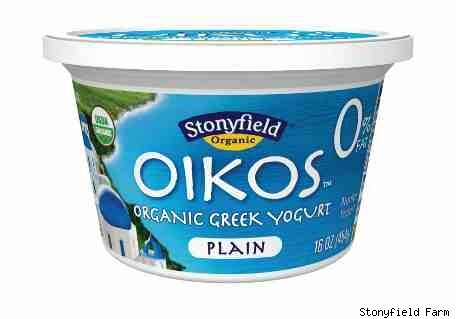 OIKOS Organic Greek Yogurt: I used to hate yogurt but I have acquired a taste for it in the past year. I eat this for my morning snack and also use it in cooking meals that require yogurt. The good stuff – it has twice as much protein as regular yogurt, less lactose, and fewer carbs. The plain yogurt has 0% fat and just 80 calories per serving which is great for a morning snack. 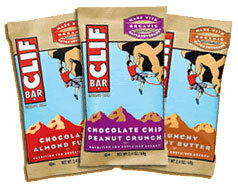 Clif Bars: And last but definitely not least, my absolute favorite little protein bar currently, the Clif bar. More specifically the chocolate chip peanut crunch Clif bar. For some reason I had always thought that these things must taste like crap, but let me tell you, eating this one is like eating a dessert that I shouldn’t be eating. It is SO good. I have one of these before a workout sometimes or in the morning with my breakfast if I don’t have time for cereal. The good stuff – great organic ingredients, high in protein and fiber, all natural, and no trans fats. Did I mention how YUMMY these are?!?! Let me go ahead and say if you have some aversion to using box cake mixes (Nikki) then quit reading how. However, if you are like me and sometimes you just don’t care as long as the final product is yummy, then keep reading my friend…you will NOT be disappointed. 1 cup chopped walnuts (optional…you could use raisins, etc as well). Preheat oven to 350 degrees F (175 degrees C). Grease a 9×13 inch baking pan, or a 10 inch Bundt cake pan. In a medium bowl, stir together the cake mix, vanilla pudding mix, and butterscotch pudding mix. Add the eggs, oil and water, mix until well blended. In another bowl, stir together the brown sugar, cinnamon and nuts. Pour half of the batter into the pan, spread evenly. Sprinkle with half of the nut mixture. Cover with the rest of the batter, and sprinkle with the rest of the nut mixture. Bake for 20 minutes in the preheated oven, then turn the oven down to 325 degrees F (165 degrees C) and bake for an additional 35 to 40 minutes. Mrs. Pig Rating: This is a wonderful cake – it’s easy, it smells good while cooking, and oh man does it taste AWESOME! Especially warm out of the oven. So, I’ve said before, I’m not a huge “sweets” person. If you give me the choice between a brownie and a plate of french fries, I’m going for the fries. Salty is my thing. However, I saw this recipe not too long ago on My Kitchen Cafe’s blog and it looked amazing. I love cinnamon rolls – I always have! I don’t eat them often at all. In fact, before yesterday I probably hadn’t had one in years, but I really wanted to make these. Everyone loves a good cinnamon roll! I was a little nervous because baking with yeast scares me. It shouldn’t, but it does. You just never know how it is going to go, yet if that one little inredient doesn’t work, then the recipe is screwed. These didn’t rise QUITE as much as I would have liked but they still did rise and they were so pretty when they came out of the oven! In a small bowl combine water, yeast and sugar. Stir until dissolved. Set aside. In large bowl, take pudding mix and prepare according to package directions. Add butter, eggs and salt. Mix well. Then add yeast mixture. Blend. Gradually add flour; knead until smooth. Do not overflour the dough! It should be very soft but not sticky. Place in a greased bowl. Cover and let rise until doubled. Then roll out on floured board to 34 X 21 inches in size. Take 1 cup soft butter and spread over surface. In bowl, mix 2 cups brown sugar and 4 teaspoons cinnamon. Sprinkle over the top. Roll up very tightly. With knife put a notch every 1 1/2 inches. Cut with thread or serrated knife. Place on lightly greased cookie sheet 1 inch apart. 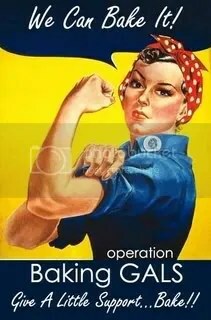 Cover and let rise until double again. Bake at 350 degrees for 15-20 minutes. Remove when they start to turn golden (don’t overbake). Frost warm rolls with cream cheese frosting (combine butter and cream cheese and mix well, then add vanilla and sugar and mix again, then add milk for desired consistency). Makes about 24 very large rolls. Pig Rating: The Pig isn’t a huge “sweets” person either so I was surprised he even wanted one but he loved it! He said it was awesome – he had one for dessert last night even after the initial “trying the baked good”. Mrs. Pig Rating: If you like cinnamon rolls, then you HAVE to make these. They are a little work and lots of clean up (well, I’m messy…) but so worth it! Warm them up in the microwave and they are perfection!!! Mrs. Pig Rating: These are absolutely my favorite muffin ever. And my favorite banana dessert/food of any kind. I will make these again and again. And they are pretty enough to take to a party or something if you need a breakfast! Yes, I totally just sounded like my brother who is in high school – but she DOES rule! What an awesome SB! Last week we had a terrible ice storm – but yes, the Fed Ex man backed right up to my front door and delivered my box of goodies to me. : ) Thank you Mr. Fed Ex man! I was so excited – Kat made THE most amazing banana muffins. They were mini muffins (so perfect for me to take to work for breakfast) AND she made them healthy. As I’ve mentioned, she is a personal trainer and a nutritionist – so I couldn’t quite believe the cheesecake (ha!) but she says this was to make up for that! (For the recipes, click here) She made them even healthier than what her recipe reads on her blog – ask her if you want to know her “secret” ingredients! I would have never guessed! As if the muffins were not enough, there was an additional gift! Background – I eat pretty healthy most of the time despite some “cheat”recipes that I put on my blog. : ) I faithfully eat a bowl of Kashi cereal with fruit every morning for breakfast (1 of my 5 meals a day). Kat owns a gym – gyms get samples. SO, she sent me a ton of Kashi cereal samples!!!!! Seriously – could she get any cooler?! Our weather people predict snow and ice quite often and it doesn’t end up happening so we never know when to believe them. However, yesterday they predicted it and boy did it come! It took me an hour and a half to get home from work when it usually takes me 10-12 minutes. I think we ended up getting about 4 inches of snow, which is no big deal but on top of that we have now received about an inch of ice. Yikes! We always do Christmas morning breakfast at my parent’s house and there is always a variety of things to eat – homemade muffins, ham, casseroles, etc. This year I decided to brave a breakfast casserole to take. I cook breakfast all of the time but casseroles have historically freaked me out a little bit…I was never one to have a bunch of food mixed together. I grew up a very picky child and some habits die hard even though I have broadened my horizons quite a bit as an adult. Anyway, I found this recipe and decided to try it. I wanted one that I could make the night before and just pop in the oven Christmas morning so I wouldn’t have to get up super duper early to fix it. Cover, and bake 45 to 60 minutes. Uncover, and reduce temperature to 325 degrees F (165 degrees C). Bake for an additional 30 minutes, or until set. Isn’t the name just great?! I mean, “monkey bread”? Doesn’t it make you smile? : ) It does me. And I used to make this with my Granny all of the time so that makes it even better. Preheat oven to 350 degrees F (175 degrees C). Grease one 9 or 10 inch tube pan. Mix white sugar and cinnamon in a plastic bag. Cut biscuits into quarters. Shake 6 to 8 biscuit pieces in the sugar cinnamon mix. Arrange pieces in the bottom of the prepared pan. Continue until all biscuits are coated and placed in pan. If using nuts and raisins, arrange them in and among the biscuit pieces as you go along. In a small saucepan, melt the margarine with the brown sugar over medium heat. Boil for 1 minute. Pour over the biscuits. Bake at 350 degrees F (175 degrees C) for 35 minutes. Let bread cool in pan for 10 minutes, then turn out onto a plate. Do not cut! The bread just pulls apart. Mrs. Pig Rating: I LOOVE this stuff. It’s almost too sweet for me first thing in the morning but I’m not used to super sweet in the morning. Put a piece of it in the microwave though and it’s sugary heaven…. Pig Rating: The pig didn’t get any since I took the whole thing to work. : ) Although, he did think this picture was a must for this blog udpate…. Mrs. Pig’s CW Rating: I think my co workers like this one : ) They keep eating it for breakfast so that is a good sign right? We had the kids tonight and I wanted something different and fun for dinner. I can remember when I was little I always thought it was cool when my mom made breakfast for dinner. The kids love helping me cook breakfast on Saturday mornings, so why not on a Wednesday night? : ) So, Sheridan did the eggs, Will set the table and helped me stir the eggs, and we did it. If you have kids or plan to, I think doing things like this with them is absolutely fantastic. These are the types of things that will remember someday – not what kind of shirt you bought them, or what color their backpack is. I remember cooking with my grandma and I love those memories.